I’m a new believer to the raw kale salad movement. I know, I’m late to this party (especially given my love for kale). But better late than never. It was this salad from Snap Kitchen that convinced me a few weeks ago. Bright, tangy, citrusy… exactly what I’m craving during this part of the winter. 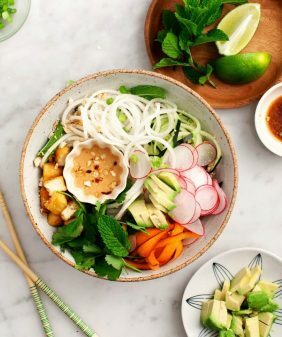 I made an asian-inspired version by whisking together a dressing of miso paste, a few squeezes of orange juice and some sesame oil… and added in avocado, and toasted almonds, and pickled red onions. And speaking of late… I’ve gotta cut this short because I’m halfway out the door to the airport as we speak. I’m heading to Alt Summit today – I can’t wait to meet so many of my blogger friends in person this weekend… if you’re gonna be there, come find me! 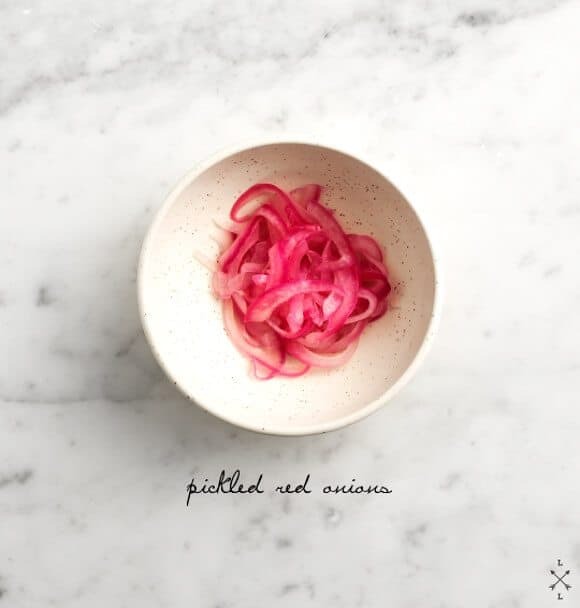 Pickled red onions: (make at least a few hours in advance) Thinly slice onions (on a mandoline if possible). Blanch in boiling water for 30-60 seconds. Remove and add vinegar, lime and salt. Chill for a few hours in the fridge (or pop them in the freezer to speed the process along, just don't forget about them). 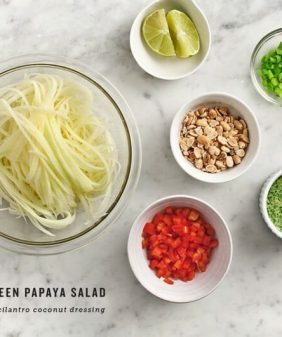 Dressing: Whisk together the dressing ingredients, set aside. 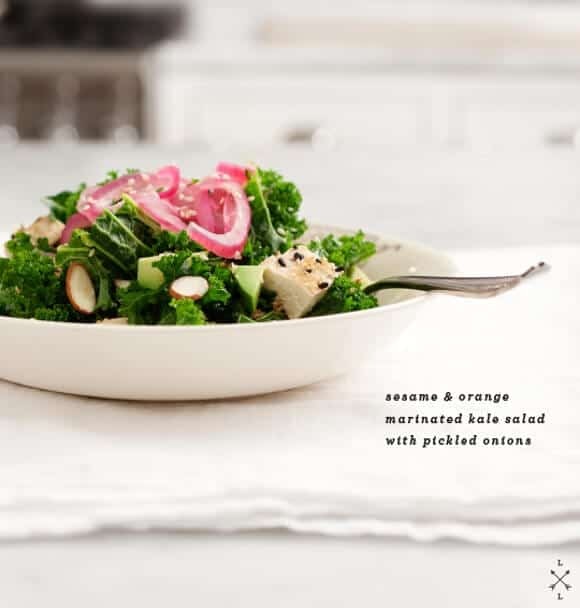 Kale Salad: Place chopped kale leaves in a large bowl. Pour the dressing on top and (using your hands), massage the dressing into the kale for a minute or so. (This will help take away the bitterness of the leaves). 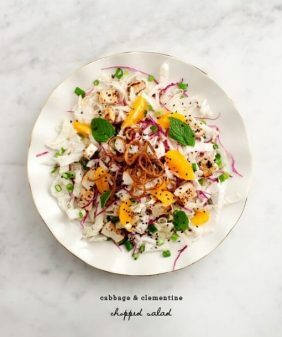 Put the bowl in the fridge for at least 30 minutes -- this salad tastes better the longer you let it sit (up to a day). Sesame Tofu: Slice your tofu and gently pat it with a clean towel to dab up some of the excess water. 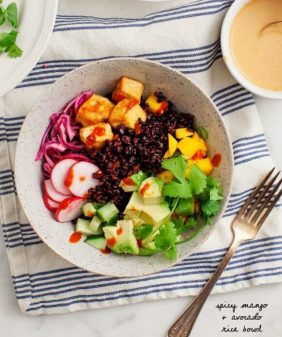 In an 8×8 square baking pan (with edges), mix together the soy sauce, rice vinegar, and sesame oil. Place the tofu slabs into the pan and flip them so you coat both sides. Set aside and let it marinate while you finish everything else (15-20 minutes or so). After it’s marinated, sprinkle both sides of each with some sesame seeds and some panko bread crumbs. Heat a large skillet with some olive oil. When the oil is hot, cook tofu for 2-3 minutes per side. Let cool to room temp and chop into small cubes for the salad. To serve, remove the salad from the fridge and taste and adjust seasonings. Add the avocado, tofu, sliced almonds, and some of the pickled onions. This looks amazing! I love the pickled red onions. I must try this soon! As usual, your photography is as stunning as the recipes! Kale salad for the win! I’ve been hooked the past few weeks. Have a blast at the Alt Summit. I’m hoping to make it next year! Looks so fresh, and like you said, perfect for winter cravings. Love the pickled onions. 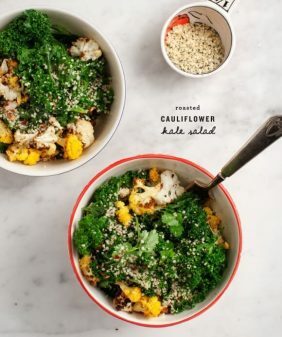 I just tried my first Kale salad last week (put it on my blog this week) and I loved it! 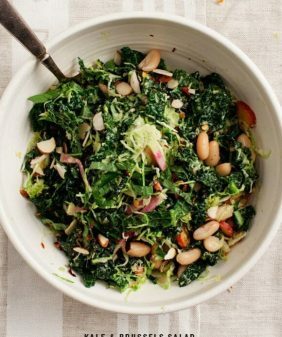 I was hesitant with Kale because it is so stiff and bitter, but I really liked it with a whole bunch of other healthy stuff in the mix! I must try this one now! Kale can be such a delicious green when dressed right! I’m really excited to try out this recipe. Love this salad! I feel like I’ve been eating heavier foods lately (probably because it’s so cold! ), and this looks like a nice way to lighten my meals up. Avocado and citrus is one of my favorite flavor combos – I can’t get enough oranges in myself lately! This salad is amazing! We are having it with dinner again tonight. The longer it sits the better the taste!